Harry Mallinder will again be available for Saints when they host Sale Sharks on Saturday. Mallinder was released by England ahead of their Six Nations defeat to Scotland at Murrayfield last Saturday. And the 21-year-old went on to play a key role for Saints in their Aviva Premiership loss to Exeter Chiefs, scoring his team's third try from full-back. Mallinder has not been named among the 27 players who will take part in an England training camp this week. That means he will be able to spend the full week with Saints and can feature against Sale at Franklin's Gardens this weekend. 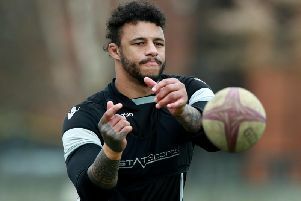 But Dylan Hartley and Courtney Lawes, who both started against Scotland, will be at England's training camp in Oxford. A total of 19 players will convene in Oxford on Tuesday for a short camp until Thursday, with eight others taking part in mini regional camps at Leicester Tigers, Pennyhill Park, Saracens and Wasps. The focus of the camps will be on reconditioning rather than rugby training as England prepare for their next Six Nations clash, in France, on March 10.